Written by: KristaG on April 29, 2016. Geek and Sundry’s 4th International TableTop Day will be held Saturday, April 30th, 2016! 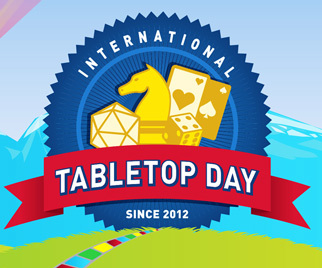 April 30th marks the fourth year for Geek and Sundry‘s International Tabletop Day! While I am somewhat excited for a chance to get together and play new games and meet even more new players at my favorite local game store in the Sacramento area, Great Escape Games, I am also filled with a bit of anger and disappointment with the changes to the celebration being made this year by Geek and Sundry. International TableTop Day is meant to bring people together to play games, share their appreciation for the hobby, and promote unity. The celebration also happens to be a day that usually comes filled with free promos, but, in an announcement that many may have missed (game store owners included), Geek and Sundry is scaling back and making their TableTop Day Kits far harder to come by. This being said, I do completely agree with those stating that the amount of promotional items had gotten a bit out of hand. There were so many available last year that I, personally, didn’t really care to try and get most of them – nor do I own most of the games that they were attached to, so it wasn’t much of a loss for me. I also side with Geek and Sundry on trying to take the day back to its roots. I, too, feel that many of the participants have forgotten what the event is actually about. It is not about collecting promos; that’s meant to be a bonus. Therefore, reducing the number included in their kits makes complete sense. However, I absolutely do not agree with the approach being used by Geek and Sundry: making the kits so limited in number (only 300 of them) that they are almost impossible to come by! Geek and Sundry is using their “Preferred Partner” retailer program to distribute their kits, and many game stores weren’t contacted, told about the changes, or even knew about the program’s existence. If they missed out on the announcement, they missed their chance entirely as participation requests surpassed the 300 mark within mere weeks of the initial announcement. There are digital assets being offered to stores that want to be able to participate, but I highly doubt this is going to work as bandaid to cover the wounds given to these stores now that they aren’t able to provide any of the exclusive event promos. A one off box from Geek and Sundry and Nerd Block. Only 3,000 were made and were sold out very quickly. Each $40 box contains approximately $70 worth of rare promos. For fans looking to get their hands on some exclusive TableTop Day swag, there was an extremely limited chance to buy some. 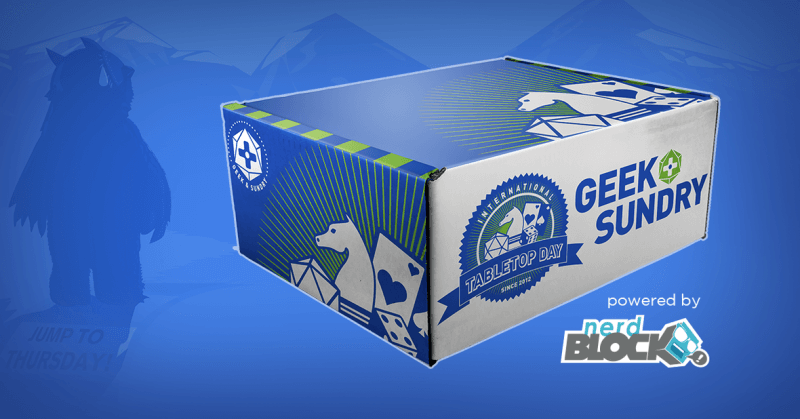 If you are a subscriber to Nerd Block, Geek and Sundry offered a one time box (worth about $70 and filled with unique and rare promotional items). However, there were only 3,000 of them created and they sold out extremely quickly. Otherwise, perhaps you can find them being sold online for ridiculous prices after the event? TableTop Day is meant to bring people together, introduce new people to the hobby as well as a chance for gamers already in the hobby to share their passion with others, and it is supposed to be about gaming. I understand and agree we should continue to send that message, but why hurt the retailers who support you by making some of them “Preferred Partners” and making it harder to host events and get people to them. Instead, why are we not scaling back what is put in the kits and, perhaps, offering Table Top Day event swag instead of promos? Perhaps a pin or a patch to collect or decals for your car or stickers for the kids to demonstrate that we showed up? As much as I like getting promos every now and again, it doesn’t make or break a game nor does it become the only reason I show up to a game night. I go for the games, the experience, the chance to meet new people, the chance to see my friends and to show some love and support to my local stores. All of this being said, there are still other ways to participate in the world wide event without having to have one of the elusive game day kits. As my article last year stated, there are events being held anywhere and everywhere (even local libraries and schools)! At Great Escape Games this year, for example, they are hosting a Batman Miniature Game tournament, a free “Magic Game Day” event for Magic: the Gathering players, and numerous boardgame demonstrations including Mysterium, Super Dungeon Explore, Sentinels of the Multiverse, and many more to check out!